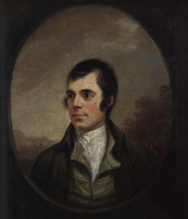 Robert Burns was born near Ayr, Scotland, 25th of January, 1759. He was the son of William Burnes, or Burness, at the time of the poet's birth a nurseryman on the banks of the Doon in Ayrshire. His father, though always extremely poor, attempted to give his children a fair education, and Robert, who was the eldest, went to school for three years in a neighboring village, and later, for shorter periods, to three other schools in the vicinity. But it was to his father and to his own reading that he owed the more important part of his education; and by the time that he had reached manhood he had a good knowledge of English, a reading knowledge of French, and a fairly wide acquaintance with the masterpieces of English literature from the time of Shakespeare to his own day. In 1766 William Burness rented on borrowed money the farm of Mount Oliphant, and in taking his share in the effort to make this undertaking succeed, the future poet seems to have seriously overstrained his physique. In 1771 the family move to Lochlea, and Burns went to the neighboring town of Irvine to learn flax-dressing. The only result of this experiment, however, was the formation of an acquaintance with a dissipated sailor, whom he afterward blamed as the prompter of his first licentious adventures. His father died in 1784, and with his brother Gilbert the poet rented the farm of Mossgiel; but this venture was as unsuccessful as the others. He had meantime formed an irregular intimacy with Jean Armour, for which he was censured by the Kirk-session. As a result of his farming misfortunes, and the attempts of his father-in-law to overthrow his irregular marriage with Jean, he resolved to emigrate; and in order to raise money for the passage he published (Kilmarnock, 1786) a volume of the poems which he had been composing from time to time for some years. This volume was unexpectedly successful, so that, instead of sailing for the West Indies, he went up to Edinburgh, and during that winter he was the chief literary celebrity of the season. An enlarged edition of his poems was published there in 1787, and the money derived from this enabled him to aid his brother in Mossgiel, and to take and stock for himself the farm of Ellisland in Dumfriesshire. His fame as poet had reconciled the Armours to the connection, and having now regularly married Jean, he brought her to Ellisland, and once more tried farming for three years. Continued ill-success, however, led him, in 1791, to abandon Ellisland, and he moved to Dumfries, where he had obtained a position in the Excise. But he was now thoroughly discouraged; his work was mere drudgery; his tendency to take his relaxation in debauchery increased the weakness of a constitution early undermined; and he died at Dumfries in his thirty-eighth year. It is not necessary here to attempt to disentangle or explain away the numerous amours in which he was engaged through the greater part of his life. It is evident that Burns was a man of extremely passionate nature and fond of conviviality; and the misfortunes of his lot combined with his natural tendencies to drive him to frequent excesses of self-indulgence. He was often remorseful, and he strove painfully, if intermittently, after better things. But the story of his life must be admitted to be in its externals a painful and somewhat sordid chronicle. That it contained, however, many moments of joy and exaltation is proved by the poems here printed. Burns' poetry falls into two main groups: English and Scottish. His English poems are, for the most part, inferior specimens of conventional eighteenth-century verse. But in Scottish poetry he achieved triumphs of a quite extraordinary kind. Since the time of the Reformation and the union of the crowns of England and Scotland, the Scots dialect had largely fallen into disuse as a medium for dignified writing. Shortly before Burns' time, however, Allan Ramsay and Robert Fergusson had been the leading figures in a revival of the vernacular, and Burns received from them a national tradition which he succeeded in carrying to its highest pitch, becoming thereby, to an almost unique degree, the poet of his people. He first showed complete mastery of verse in the field of satire. In "The Twa Herds," "Holy Willie's Prayer," "Address to the Unco Guid," "The Holy Fair," and others, he manifested sympathy with the protest of the so-called "New Light" party, which had sprung up in opposition to the extreme Calvinism and intolerance of the dominant " Auld Lichts." The fact that Burns had personally suffered from the discipline of the Kirk probably added fire to his attacks, but the satires show more than personal animus. The force of the invective, the keenness of the wit, and the fervor of the imagination which they displayed, rendered them an important force in the theological liberation of Scotland. The Kilmarnock volume contained, besides satire, a number of poems like "The Twa Dogs" and "The Cotter's Saturday Night," which are vividly descriptive of the Scots peasant life with which he was most familiar; and a group like "Puir Mailie" and "To a Mouse," which, in the tenderness of their treatment of animals, revealed one of the most attractive sides of Burns' personality. Many of his poems were never printed during his lifetime, the most remarkable of these being "The Jolly Beggars," a piece in which, by the intensity of his imaginative sympathy and the brilliance of his technique, he renders a picture of the lowest dregs of society in such a way as to raise it into the realm of great poetry. But the real national importance of Burns is due chiefly to his songs. The Puritan austerity of the centuries following the Reformation had discouraged secular music, like other forms of art, in Scotland; and as a result Scottish song had become hopelessly degraded in point both of decency and literary quality. From youth Burns had been interested in collecting the fragments he had heard sung or found printed, and he came to regard the rescuing of this almost lost national inheritance in the light of a vocation. About his song-making, two points are especially noteworthy: first, that the greater number of his lyrics sprang from actual emotional experiences; second, that almost all were composed to old melodies. While in Edinburgh he undertook to supply material for Johnson's "Musical Museum," and as few of the traditional songs could appear in a respectable collection, Burns found it necessary to make them over. Sometimes he kept a stanza or two; sometimes only a line or chorus; sometimes merely the name of the air; the rest was his own. His method, as he has told us himself, was to become familiar with the traditional melody, to catch a suggestion from some fragment of the old song, to fix upon an idea or situation for the new poem; then, humming or whistling the tune as he went about his work, he wrought out the new verses, going into the house to write them down when the inspiration began to flag. In this process is to be found the explanation of much of the peculiar quality of the songs of Burns. Scarcely any known author has succeeded so brilliantly in combining his work with folk material, or in carrying on with such continuity of spirit the tradition of popular song. For George Thomson's collection of Scottish airs he performed a function similar to that which he had had in the "Museum"; and his poetical activity during the last eight or nine years of his life was chiefly devoted to these two publications. In spite of the fact that he was constantly in severe financial straits, he refused to accept any recompense for this work, preferring to regard it as a patriotic service. And it was, indeed, a patriotic service of no small magnitude. By birth and temperament he was singularly fitted for the task, and this fitness is proved by the unique extent to which his productions were accepted by his countrymen, and have passed into the life and feeling of his race. Information supplied by Electric Scotland (click for more about Burns) A great resource for everything Scottish. Thanks Alastair!